This integrated unit features two sets of three sliding doors. 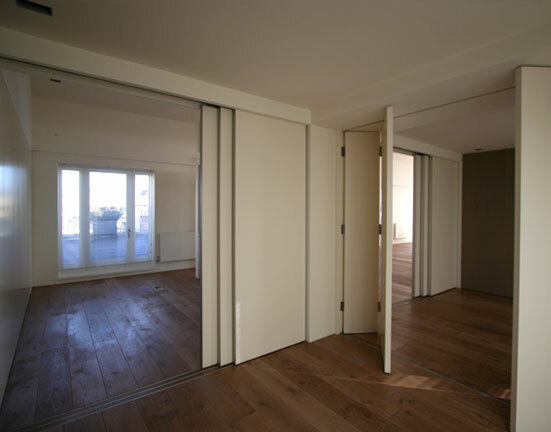 Partitions were made from spray-lacquered door blanks with mirrored faces and anodised aluminium edging. The panelled wall was made from suede-covered MDF panels with anodised aluminium edging (designed to mirror the wardrobe opposite). We also created a free-standing storage unit with shelving and large pullout draws underneath, also made from spray-lacquered MDF. A plasma TV was fitted on other side of unit and the bathroom cupboards were given under-unit lighting with mirrored doors and anodised aluminium edging.